This story originally appeared on Great Lakes Today and is republished here with permission. In a long-awaited report, the U.S. Army Corps of Engineers says new measures are needed to prevent Asian carp from getting into the Great Lakes. 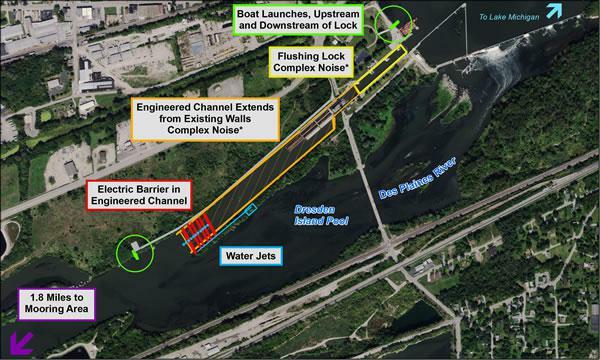 The report says the current defense at the Brandon Road lock in Illinois — an underwater electric barrier — should be beefed up. The Army Corps’ recommended plan would add water jets and complex noises — like the underwater recordings of a boat motor. The total cost of implementing the Army Corps’ “Tentatively Selected Plan” is estimated at $275 million, with 65 percent coming from the Army Corps and the rest from non-federal contributors. Molly Flanagan, vice president of policy for the Alliance, said Friday that she was glad the report calls for more aggressive moves. Millions of dollars have been spent to keep the invasive species out of the lakes, and defenses are concentrated near the southern tip of Lake Michigan. Two varieties — the Silver and Bighead — pose the biggest threat because of their voracious feeding habits. They consume lots of zooplankton, the microscopic animals that other fish feed on. In June, a live Asian carp was discovered nine miles from Lake Michigan — beyond the electric barrier. Flanagan cites that discovery, plus the continued efforts of Great Lakes politicians and organizations as reasons for the Trump administration’s release of the study after months of delay. Flanagan believes the administration delayed the release the study due to concerns raised by legislators and members of the shipping industry. Other politicians have raised concerns too, including Illinois Lieutenant Governor Evelyn Sanguinetti. Earlier this year, Sanguinetti called the Brandon Road plan an “unnecessary experiment”. In a statement today, Sanguinetti says the Army Corps’ recommended plan is “neither cost effective nor environmentally sound.” She says the $275 million project will hurt her state’s economy. A bipartisan group of Congressmen and Senators recently introduced the Stop Asian Carp Now Act in Congress. The Army Corps will accept public comment on the study until Sept. 21, and will hold two public meetings.